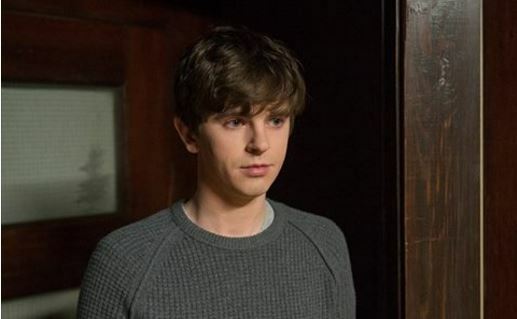 We have a special double-edition Bates Motel recap from Special Contributor Tracey M. this week! In it, we find that Norman opens up to Dr. Edwards; Norma worries about Chick’s motives; and Alex makes a life-changing decision. Later, Norman has a surprising request for Dr. Edwards; and Dylan suspects there may have been foul play at the hotel. And Norma and Alex grow closer still. Check it out! – David F.
Following his unsuccessful meeting with Norma the previous evening, Chick stops by with the finished stained glass window. Norma refused to give Caleb’s location, and has steeled herself for the consequences. 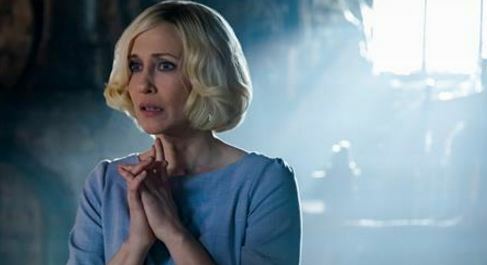 Vera Farmiga shows so much depth in all her characters, and Norma Bates at her breaking point is my favorite. Mother Bates will go down fighting – kicking and screaming if necessary. And wow, did she scream at Chick. She and Chick stare each other down, making Alex curious. Norma tearfully admits to Alex that Caleb is Dylan’s father and Chick has been holding that over her head to get to Caleb. Norma expects Alex to leave after the big reveal, but Alex is a stand-up guy. He holds her and promises that he’s not going anywhere. I cried tears of relief along with Norma. In session with Dr. Edwards, Norman morphs into Norma while in a blackout. “She” explains what happened at the hands of her deceased husband, Sam (David Cubitt). Try as she might, she couldn’t escape the hellish marriage. Caught trying to leave, she and Norman are dragged out of the car. Norma tells Norman to run and hide. Sam throws Norma on the bed and forces himself on her. Little Norman is hiding under the bed, so scared. He tries to comfort his mother, grasping her hand and waiting for the horror to end. We’re getting closer to what’s wrong with Norman. My heart breaks for him. I think I’d be at Pineview, too, if I had lived through that hell. After such a draining session, he won’t leave his room, afraid of what got revealed during his blackout. Back at the motel, Norma and Alex go at it like rabbits. I think it’s fair to say this is a happy union. Norma seems to have mixed feelings about Norman’s absence, though, peeking into Norman’s room as she follows Alex to the kitchen for coffee. At Pineview, Norman and Julian are in art therapy making paper-mache creations. Norman is using strips of newspaper, making a dog that looks an awful lot like Juno. It’s as if he’s starting to feel at home at Pineview. Julian steps out for some air, and Norman discovers his mother’s marriage to Alex in the strips of newspaper. Uh oh…. Norma is embarrassed to admit her financial difficulties to her new husband. Alex whips out Bob Paris’ stash. He was telling her the truth when he joked he was stashing cash down there. Norma doesn’t want to touch the blood money, but Alex insists she use the money for whatever she needs. While Norma and Alex are kissing, the phone rings. Alex answers, it’s Norman. Oh no. A wily Norman asks Alex why the sheriff is answering the phone. Is something wrong? Norma foolishly lies to Norman. He says he’s heading home, unless there’s a reason he shouldn’t. Norman then heads to the front desk, asking to be released. He’s told he must go through a 72-hour process, and submit a letter attesting that his current mental state is stable. Ha! Norman says that he’ll do what’s necessary to leave. The receptionist tells Norman that his step-father’s insurance covers a 3-month stay. He bristles at the notion of a “step-father”! There’s a storm brewing in Norman’s baby blues. Emma and Will are arguing about her mother Audrey (Karina Logue) when Dylan walks in. He’s just in time for Will to ask him to back him up about Audrey’s behavior at the hospital. Emma is mad at both of the men in her life. Whether or not she wants a relationship with her mother is her decision. She dials her mother’s number, but it’s out of service. Emma thinks it’s typical of her irresponsible past. Later, Dylan makes calls trying to reach Audrey Decody. Her landlord says it’s been four months since she last saw Audrey, so she removed all her belongings, considering them abandoned. Dylan brings Emma her letter, and tells her what he found out about her mother. Emma thinks the letter is another ploy by her mother, and she doesn’t trust her. Alex has given Rebecca the second key to Bob Paris’ safety deposit box, and is glad to be rid of it. Rebecca says she plans to leave town. Good! Alex is off the market, you thirsty broad. Dr. Edwards finds Norman typing up his discharge request letter. Norman asks for a prescription for the medication they discussed to help with his blackouts. Dr. Edwards isn’t giving in so easily, and he shouldn’t. Norman may be crazy, but he’s wily. Dylan stops by to see Norma. She’s humming, making jam and sewing curtains, dancing on air. She tells Dylan he should bring Emma along to pick out their Christmas tree. Dylan asks if she knows Norman hid the letter Emma’s mother sent. Norma says she was suspicious about Audrey and wouldn’t take the envelope. Dylan says that Norman intercepted the letter and Audrey never checked out of the motel. He thinks Norman has something to hide; his blackouts are dangerous. Norman has sickening visions of his mother with Alex, and seems on edge at breakfast with Julian. He says he’s going home, Julian doesn’t believe him. He tells Norman there must be a reason he’s at Pineview. Norman says the difference is that he’s smart and can fool people. He tells Julian he’ll never get out. Norman’s cold and distant, focused on his own agenda. Norma comes to Pineview to meet with Dr. Edwards. He says Norman has the right to check himself out, but that she can petition the court and have his commitment upheld. She thinks she might be able to talk Norman into staying. Yeah, good luck with that. Norman knows you lied. In fact, he’s a bit detached when mother hugs him and when she cajoles him to stay. She goes on to extol the virtues of Dr. Edwards. Norman wants to know if his continued commitment has anything to do with her nuptials. Gulp! He shows her the newspaper article he pasted back together. She stammers that the marriage was for insurance, to help Norman get into Pineview. Norman begs to come home, he cries, then she cries. Norma gives in even though she is really scared — as she should be. Dr. Edwards finds Norman alone in the art studio, still working on his dog. Dr. Edwards tells Norman how he behaves when he’s in a blackout state. Norman admits he’s scared of the blackouts, and hopes the medication will help. He begs Dr. Edwards not to abandon him once he leaves. The doctor promises Norman three sessions a week and his discharge from Pineview. Norma is drained and comes home to find her new husband and a 60” television in her living room. She tells Alex that Norman will be coming home. So soon??? Alex is perplexed and a bit ticked off. Despite his concerns, he reassures Norma that they’ll be alright.